Castle Rock is a home rule municipality that is the county seat of Douglas County, Colorado. It is named for the prominent, castle tower-shaped butte near the center of town. Located midway between Denver and Colorado Springs, Castle Rock is part of the Front Range Urban Corridor. One of the first homesteaders in the area near today’s Castle Rock was Jeremiah Gould. He owned about 160 acres (0.65 km2) to the south of “The (Castle) Rock.” At that time, the settlement consisted of just a few buildings for prospectors, workers, and cowboys. In 1874, Jeremiah Gould donated 120 acres (0.49 km2) to the new town that was also now home to the Douglas County government. For the beginning the six streets named Elbert, Jerry, Wilcox, Perry, Castle and Front were laid out to build the actual town of Castle Rock. The Courthouse Square was defined and about 77 lots, each 50 by 112 feet (34 m), were auctioned off for a total profit of US$3,400. 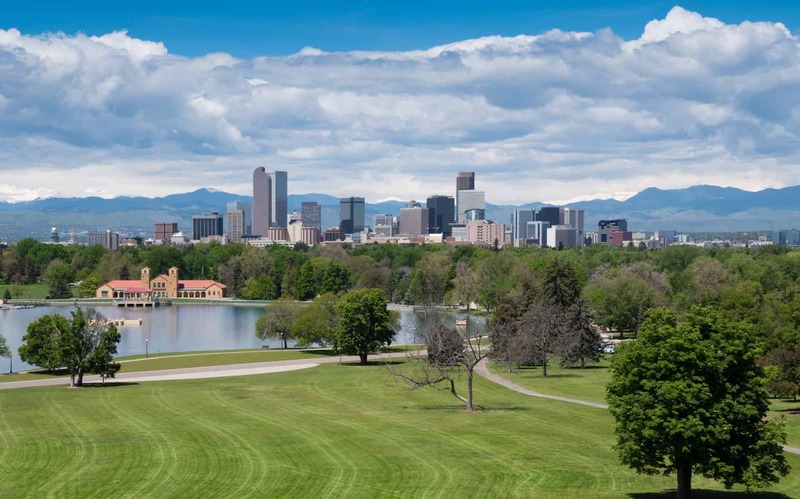 Located in central Colorado at the junction of Interstate 25 and State Highway 86, Castle Rock is 28 mi south of downtown Denver and 37 mi north of Colorado Springs. The town lies a few miles east of the Rampart Range of the Rocky Mountains on the western edge of the Great Plains. Castle Rock, the butte that is the town’s namesake, sits just north of the town center. Other prominent landforms visible from Castle Rock include Dawson Butte, Devils Head, Mount Evans and Pikes Peak. East Plum Creek, a stream within the South Platte River watershed, flows generally north through Castle Rock. Hangman’s Gulch, which runs northwest then west around the north side of the town center, drains into East Plum Creek as do multiple unnamed gulches in the southern and western areas of town. McMurdo Gulch and Mitchell Gulch run north then northeast through eastern Castle Rock and drain into Cherry Creek east of town. Castle Rock is a Home Rule Municipality with a council-manager form of government. The town council consists of seven members, each representing an election district, elected to four-year terms. One member, appointed by the council, serves as mayor, presiding over council meetings, and another member serves as mayor pro tem. The mayor presides over council meetings and casts one vote, like other council members. The council sets policy for the town, adopts ordinances, approves the town budget, makes major land-use decisions, and appoints key town government staff including the town manager, town attorney, municipal judge, and members of town boards and commissions. The town manager, David Corliss, supervises all departments, prepares and implements the town budget, and works with the council to develop policies and propose new plans. Tax revenues are used to provide general government, fire, police, parks maintenance and programs, street maintenance and operations, support for recreation, and planning and code enforcement services. The town also provides development services, golf, water and sewer services to residents through self-supporting enterprise funds. As of 2013, Castle Rock lies within Colorado’s 4th U.S. Congressional District. For the purposes of representation in the Colorado General Assembly, the town is located in the 4th district of the Colorado Senate and the 45th district of the Colorado House of Representatives. Castle Rock has a weekly newspaper, The Douglas County News-Press. Television station KETD, an affiliate of the LeSEA network, broadcasts on digital channel 46. Licensed to Castle Rock, the station is located near Centennial, Colorado. Castle Rock is part of the Denver radio and television market. Radio station KJMN is licensed to Castle Rock, but broadcasts from Denver playing a Spanish Adult Hits format on 92.1 FM. Denver radio station 850 KOA, which broadcasts a news/talk and sports format, operates its 50,000 watt transmitter from a site 10 miles northeast of downtown Castle Rock, in the town of Parker. Another Denver station, KEZW “Studio 1430”, a CNN affiliate with a nostalgia music format, operates its transmitter from Highlands Ranch, 13 miles north of downtown Castle Rock. NPR programming can be heard on Colorado Public Radio’s KCFR-FM. Castle Rock is also served by the AM signal of KGNU, a non-commercial affiliate of PRI, Pacifica, and the BBC World Service, and which also provides diverse music programming. Castle Rock’s open space and parks comprise 27% the town’s total land area (5,415 acres (21.91 km2) of parks and open space / 20,224 acres (81.84 km2) total land area). Additionally, there are nearly 75 miles (121 km) of soft-surface and paved trails. Parks – Baldwin Park, Bison Park, Butterfield Park, Castle Highlands Park, Castle North Park, Castlewood Canyon State Park, Centennial Park, Festival Park, Founders Park, Gemstone Park, Glovers Tot Lot, Matney Park, Metzler Ranch Park, Mitchell Gulch Park, Paintbrush Park, Plum Creek Park, Rhyolite Regional Park, Rosecrown Park. Trails & Open Space – East Plum Creek Trail, Gateway Mesa Open Space, Hidden Mesa Open Space, Memmen Ridge Open Space, Mitchell Creek Canyon Trail, Mitchell Creek Trail System, Native Legend Open Space, Quarry Mesa Open Space, Ridgeline Open Space, Rock Park, The Bowl. The Sri Venkateswara Temple’s 8 acre complex located on Ridge Road is a significant landmark for the Hindu community of Colorado, attracting regular worshipers from as far away as Colorado Springs and Denver. The Temple also invites Swami’s to lecture, offers classes, and undertakes outreach and service programs in the community.